School concession stands are more than soda, popcorn, and hot dogs. Your game day concession stands are a huge opportunity for your school to provide students, parents, and community members with school spirit products they will proud to use. Stock your stands with these 10 spirit products and watch your profits soar! Fun cups do double duty as concession stand favorites! 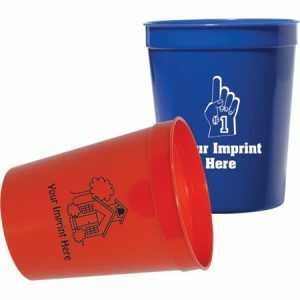 Not only can you fill them with soda or slushies and sell them as refreshing beverages, but you can also get them custom imprinted with your school name and mascot and sell them as fun school spirit items. 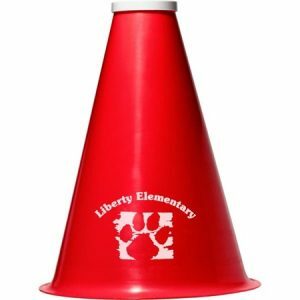 Perfect for game day, Field Day, and school carnivals, noisemakers will be huge hits in your school concession stands. Stock up on custom imprinted cheer sticks, megaphones, and hand clappers. They offer students easy ways to make a ton of noise and show their school spirit at all your school events. The best way to get fans to buy some new spirit items is to have your concessions staffers decked out in full spirit attire–including lots of beads in your school colors! 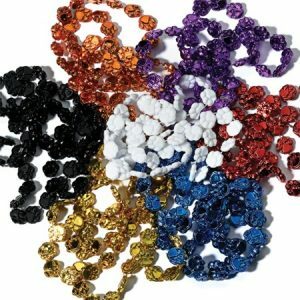 Whether they’re round beads or football-shaped, bead necklaces are must-have wearables for your fans. With their unique shapes and large sizes, foam rousers might as well have a dollar sign stamped onto them. The sight of popular foam paws, sports balls, and hands are sure to attract lots of students and fans to your concession stands. Serve up some tasty treats and school spirit in this one functional item – a popcorn megaphone! You can even advertise it as a ‘twofer.’ They get some popped popcorn and a noisemaker in one! Once the popcorn is gone, fans can cheer on the home team with the empty megaphone. Imagine hundreds of fans sitting on those hard bleachers during game day. You can help keep those disgruntled fans a bit more comfortable; stock seat cushions in your concession stands! A cushy seat can make long games more endurable. The fall season can be unpredictable, weather-wise. So, be sure to stock your concession stands with lots of custom knitwear options, like caps, gloves, and scarves. They will keep both students and school pride nice and warm! Car magnets, bumper stickers, and window decals are fun and easy ways to get your school name out there and to pump up school spirit within the community. Teachers, staff members, and parents will love to purchase car accessories, so they can spread school spirit wherever they go. Students love to look cool and fashionable during game and event days. Give them what they want with custom sunglasses! Add a simple imprint to your sunglasses and sell them in concession stands. They’re the hot and bright way to warm up your school pride. The familiar swishing sound of poms being shaken in time to your school song is a familiar sight at every school. Keep those concession stands fully stocked with poms in your school colors so everyone has easy access to this hugely popular spirit product.